This is a list of pre-release and unused content for the game Super Mario 3D Land. While the Super Leaf and P-Wing came back, and Hammer Mario returned in the form of Boomerang Mario, producer Yoshiaki Koizumi stated that more classic suits and powers were to return, but no more appear in the final product. The Goomba's Shoe and Tanooki Mario's flight were considered, but were later rejected. In the May 2012 issue of Nintendo Power, it was revealed that Cape Mario would have returned instead of Tanooki Mario, but the latter was eventually chosen. Additionally, Raccoon Mario was considered, but was also passed over for Tanooki Mario, for visual clarity. Yoshi would have appeared, but was rejected. The Invincibility Leaf was also supposed to appear after eight deaths in one level, and the P-Wing after sixteen deaths. Instead, the Invincibility Leaf appears after five deaths, and the P-Wing after ten deaths. At GDC 2012, director Koichi Hayashida revealed several ideas that came up early in development but were rejected, which include a skating section involving riding a Koopa shell down a half-pipe, a cockroach enemy that could be defeated by shutting the 3DS, the option to replace Princess Peach's face with that of someone else, a giant Mario in which the player would only be able to see Mario's legs, and a stretched Mario with very long limbs. While creating the level that would be World 5-2, the developers noticed that the top-down view made the level look like a dungeon from a 2D The Legend of Zelda game. Since it was the 25th anniversary of The Legend of Zelda franchise at the time, the developers wanted to make the level World 2-5, in reference to the anniversary itself, but decided that the reference would be too early if placed there and made the level World 5-2 instead. A screenshot of four early or cut levels. The ones in the bottom left and top right corner were supposedly cut. A grassy spacious area and a level with many Donut Lifts, platforms and arrow blocks were shown, along with a array of rotating platforms which would go on to be World 4-3. Though while the grass area and Donut Block area are supposedly cut, these areas might have evolved into World 2-1 and World 8-1 in the final product, due to featuring similar layouts. The screenshots of these areas show that they use a camera angle not used in the final game, implying that the game would have had more dynamic camera angles. One of two enemies appearing in the early World 2-3. In the first game trailer when Mario enters the pipe of a mushroom-shaped platform (which appears to be a early World 2-3), the camera zooms out to two Coin Coffers. which have an early appearance. It can be seen in the E3 2011 trailer that the fake Bowsers did not have a Tanooki Tail. Unless there were no fakes included in the game at the time and the real Bowser was fought several times throughout the game instead of twice, the reason this was is unknown. Also, as shown in the E3 2011 Trailer, Boom Boom's voice was different than in the final version and Bowser's battle area was also different, as there was no switch to drop him in the lava, as well as a lot of the platforms looking different. The trailer also shows World 4-5 (called 3-3 in the demo) to have several coins spread out on the area with four Snake Platforms. In the actual game, there is one coin that creates a line of several when collected. World 1-2 – The design of World 1-2 was different in the E3 demo, and the Warp Zone had three green pipes in it instead of one orange pipe, probably because the Warp Zone has not been developed at the moment. Also, the first two pipes lead Mario to the pipe besides each other, and the third pipe takes him to the normal exit. There were also two Paragoombas in the area after the midway flag, which were replaced by three Koopas in the final version. Also the Spinners only appeared above the bridge, and the second one in that part was moved to the start of the level in the final version. World 2-1 – This level would have, originally, contained no yellow spotted jumping platforms after the cutouts of Goombas. Instead, these were white Note Blocks. In the early World 2-3, the Super Mushroom platform was the original Super Mushroom, with less features. The Mario platform had a Warp Pipe. World 3-3 – (World 4-5 in release version) This level was different in the E3 demo. The orange yellow platforms were generally smaller in comparison to the release version. There is not a Boomerang Bro where the Mystery Box is and just after the second Warp Box. The second Star Medal was where the group of 10 second time extenders were in the release version. Where the Midway Flag was the Warp Box did not disappear and the sides of the platform had no railing. In the E3 demo, World 2- Airship was originally called World 2-5. In the E3 demo, Mario had a different walking animation, like he did in an early version of Super Mario 64. Also, the last few notes of the dying music were a bit different in the demo. The sound effect when Mario gets a Coin was originally similar to Super Mario Galaxy's. The sound effect when Mario gets a Star Medal is different, and so does the 1-Up sound effect. While walking or dashing, Mario could perform a roll when or was pressed. In the release version, Mario can only roll if he crouches first (crouching can be performed by pressing or while standing still). He cannot go straight into a roll from walking or dashing. Trying to perform a roll using the controls from the demo in the release version, will cause Mario to do a slide while crouching. However, it's still possible to roll while moving - simply run, crouch, and then press . This was probably done to make the game a bit more reminiscent of the older games, where Mario could slide under obstacles by crouching while running, and also make it possible to roll like in the demo. Due to the change, when Mario long jumps, he doesn't do a flip as seen in early videos. Instead, a "regular" animation is used. Even this has an exception: it's actually possible to do the flip, the player simply needs to press the jump button while in a roll, as stated in the game's electronic manual. According to the official Super Mario 3D Land Iwata Asks feature, Miyamoto disapproved of these early rolling controls because they weren't intuitive and didn't make immediate sense. Also, when Mario stomped on an enemy, a coin would pop-up for Mario to collect, like in various of his 3D games. However, in the release, when Mario stomps on an enemy, a coin appears for a second and then disappears, while Mario collects it automatically. The Warp Box originally also sent Mario to a bonus area, like the Mystery Boxes, which happens more rarely in the original game. Later, the Warp Box was purple instead of orange. Additionally, the purple box shown in the trailer closes when Mario reaches his destination, instead of disappearing like in the final game. Also present in this demo was a glitch which allowed the player to escape World 1-2 while in the small isle with the Midway Flag. It was possible using the Tanooki suit to bounce up the wall and get on top of the level and out of the level boundaries. This was patched in the release version by making it impossible to bounce off the wall after a certain height. Another thing changed in the final game is that when the player hits a Question Block with an item inside, the item stays on top of the block like in past Mario titles instead of flying out of it and onto the ground like in the final game. The sound effect that plays when Mario tosses a fireball as Fire Mario is also different in the demo. A translucent checkerboard pattern over laying the paused game (as opposed to nothing). The "PAUSE" symbol blinked faster. The slightly larger and horizontally stretched font on the menu items. Using "To Course Selection" instead of "Select Course". The button selector was gold instead of brown and never was fully inside the selected button. It also did not appear unless the player used the or . Also the button selector could be made to disappear by touching the touchscreen. Buttons acted as if they were being pressed when the button selector is over the button. In the demo, touching the Midway Flag would add 100 extra seconds to the timer. This was removed in the final release and levels simply lasted longer. In the E3 demo, the maximum number of lives was 99. In World 2- Airship, the battle with Boom Boom featured Peewee Piranha's theme from Super Mario Galaxy 2, but was later changed. The music was likely a placeholder for the music that ended up being in the final version. When the player grabs the Goal Pole, it originally still shows the Bowser flag as the player slid down and it stayed at the top, then when the player reached the bottom, the flag changed to Mario's emblem. Also, after clearing a boss level, the same normal flagpole appears, and the fanfare used for clearing a normal level plays. Another difference is the fact that the player does not obtain coins for beating a level. In the second game trailer, golden versions of the Tail Goomba are seen in World 2-1. They can glide farther than the regular ones. However, they were removed in the final version. Another difference in 2-1 is the presence of a fake Warp Pipe where three Question Blocks are located in the final game. The trailer also shows the backup stash on the map screen to be on the bottom left corner of the screen; in the final version, it is on the top right, directly underneath the life counter. World 3-1 also appears differently in this trailer. At the start of the level, there is no Coin Ring seen from the cannon. Additionally, the player reaches the second story of the first interior area by using a Jump Block and an elevator rather then a Warp Box like in the final version. There is also a fake 1-Up Mushroom next to the Thwomp that isn't in the released game. There is also a change in World 2-3. When the player is using the Propeller Box to reach the Mushroom platform, there is a series of Paragoombas and a green + Clock; this clock was replaced with a Coin Ring in the final version. 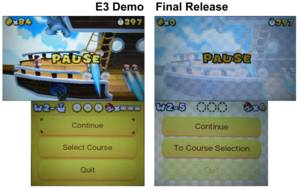 Also, when Mario reaches top of the flagpole, 10 coins are awarded, as opposed to a 1-Up received in the final version. Super Mario 3D Land originally went under the tentative name "Super Mario", first being titled this during its debut at the 2011 Game Developers Conference. Nintendo of America President and COO Reggie Fils-Aime later called it "Super Mario 3D;" the addition of "Land" in the name was not revealed until the news on the drop of the 3DS price and one of the newer trailers - the same one as the first but with the logo replaced. A lot of merchandise based on the game never had the logo name changed. ↑ Dutton, Fred (March 8, 2012). Nintendo reveals rejected Super Mario 3D Land ideas. Eurogamer. Retrieved May 19, 2014. This page was last edited on November 25, 2018, at 18:59.